I've been thinking of a creation system without skills using a NPC. I believe there are a lot of thinks which are more important than a real skill based creation system. - And a possible temporary solution might be a receipt based system using a NPC. Here is a list of possible materials and actions. If the player is using items in a wrong order or is using the false material all the used materials get lost. Action like "heat up" requires SP Points... So the players have to recover a bit. The creation of better items requires more materials and more steps. - Hello, what would you like to do? - - - - I'm finished! How the player can get materials? 2. Drop of monsters... of course, rare materials should be just dropped by monsters. To prevent the usage of macros to get a lot of crafting materials we can increase the material weight of "one unit of metal" to 5000 or something heavy. wood=2000,... that must be balanced and I've not been thinking about that. Why increasing the weight to a high number? - Because the player should not be able to get 100 units of material to craft 100 daggers... That also prevents the crafting of super strong weapons... because the total of weight is more than the player can carry to the crafting NPC. First of all I though it would be impossible to do that in the tmw scripting language because it would be very complex... multiple goto's for every receipt, step and material... Fortunately I managed to get it very short. As you will see, the list of possible materials and actions includes Numbers. Every material and action symbolise a digit from 0 to 99. Possible problem: I don't know how big the number in the script can be??? I have never done a script for tmw before and its only tested on a piece of paper . Info: heal 0, -10; should decrease SP but I don't know if its allowed to put a negative number in that function... I even don't know if the calculations are working THAT way. Scripts are more or less finished! Today I set up a private server and try to get everything working! ... And its working! I've been working the whole day, the result is nearly a complete working forging system. Only the material items, NPC graphics and farming items (saw, pickaxe, lumberjack axe,...) are missing (these items just supposed to be in the inventory! -> one graphic). Thats the forging help... He tells the basics. Last edited by Peacemaker on 07 Jan 2007, 17:53, edited 1 time in total. i would love to see some kind of forging system in the mainstream version of TMW. Do you have any interesting screenshots to share with us? or is it mostly just a working scripts without any graphics? Dr Wahl wrote: i would love to see some kind of forging system in the mainstream version of TMW. Do you have any interesting screenshots to share with us? or is it mostly just a working scripts without any graphics? Last edited by Peacemaker on 08 Jan 2007, 13:45, edited 1 time in total. We could place the new npc's in the new woodland village that is going to be released, soon. I also think that we should have new weapons that are created by crafting. You could use the raw wood log as wood. It should be already included in TMW graphics. more "rough" versions of the sharp knive and the dagger that look more like they are made by an amateur. The log is an old graphic, the iron ore and stones are new. Crush wrote: We could place the new npc's in the new woodland village that is going to be released, soon. Problem#1: First of all I'm of the opinion that the "ADD <material>" and "DO <action>" list would be much to long. The current system allows 99!!! materials/actions at only one NPC... That limits the max. crafting steps to 5 because the script is working with signed int (-2.147.483.647 to +2.147.483.647) variables. To increase the crafting step I'm thinking of limiting the list of materials and actions to 10 (which means they need just one digit and that means I can include receipt using 9 steps). ADD:		wool, textile, leather kit, iron kit, ??? In the next days I'll concentrate on the Blacksmith and the Huntsmen. So those kinds of material make more sense to buy directly at a lumberjack... That kind of human NPC would fit perfectly into the woodland village. You shouldn't rush things. I would suggest you to start small, try it out in the field, see how well it works, and add more posibilities later. Also you shouldn't invest too much time and energy into this. When the new server is finished we can't use the old scripts anymore because we will use a different scripting language. Crush wrote: You shouldn't rush things. I would suggest you to start small, try it out in the field, see how well it works, and add more posibilities later. Also you shouldn't invest too much time and energy into this. When the new server is finished we can't use the old scripts any more because we will use a different scripting language. 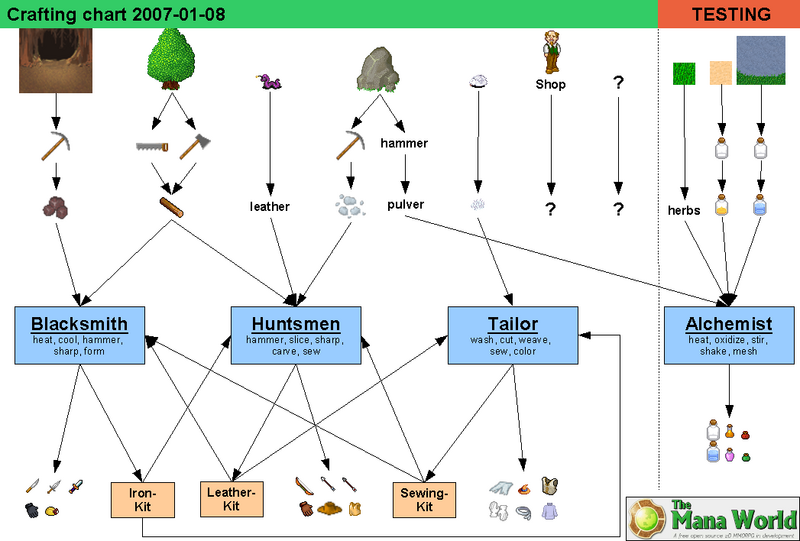 -> allows to craft the "sharp knife" and the "dagger"
-> allows to craft the "150 standard arrows"
Last edited by Peacemaker on 07 Jan 2007, 18:11, edited 1 time in total. Could you please post a list of all necessary item graphics? Could you please describe a bit more precise how the iron kit, leather kit and sewing kit should look? Would a hammer for iron, a special scissor for leather and a sewing needle with thread be sufficient? Crush wrote: Would a hammer for iron, a special scissor for leather and a sewing needle with thread be sufficient? Iron-Kit: an arrow head (triangle), a plate (square or rectangle), chain, nail or something. A hammer doent fit because there is nothing in that kit which needs to be rebuild. Sewing-Kit: a "sewing needle with thread" would fit perfectly.